An 85-year-old Norway spruce from Pennsylvania arrived in Manhattan on Saturday. The tree will be decked out in 45,000 lights at a tree-lighting ceremony later this month. Adam Kuperstein reports. Grab a cup of hot cider and dust off the Christmas cheer, one of the first signs of the holiday season made its gigantic entrance into New York City on Saturday. 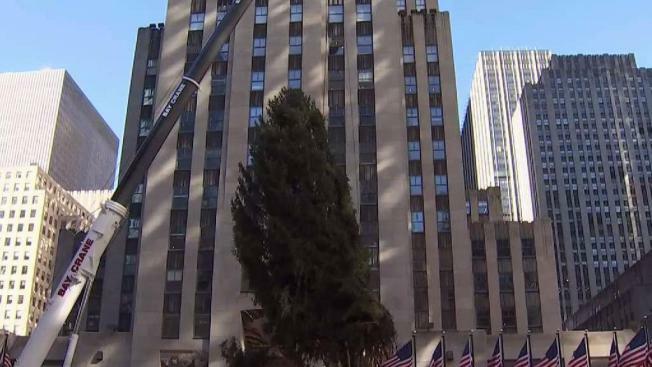 The 75-foot-tall Norway spruce arrived by truck in midtown Manhattan early Saturday and was lifted into place by a giant crane to its seat of honor next to the iconic ice rink at Rockefeller Plaza. See more pictures of the tree's journey here. After the holiday season, the Rockefeller trees are cut into boards and donated to Habitat for Humanity.